NIKON AF / MF SLR NIKKOR 50mm 1:1:8 CAMERA LENS *MINT! 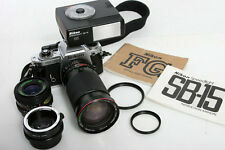 VINTAGE NIKON NIKKORMAT 35MM SLR CAMERA + AUTO 1:3.5 f-55MM NIPPON LENS & CASE! Tested! BLACK BODY - NIKON FM 35mm SLR CAMERA - 3339719 POWER WINDER - NICE!!! This page was last updated: Apr 21 12:20. Number of bids and bid amounts may be slightly out of date. See each listing for international postage options and costs.